Time: 7,000 – 5,000 B.C. 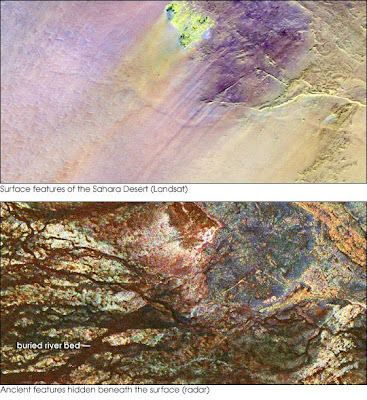 Bottom Picture: Rock layer underneath, revealing black channels cut by the meandering of an ancient river. Taken by Spaceborne Imaging Radar-C/X-band Synthetic Aperture Radar (SIR-C/X-SAR) on board the Space Shuttle Endeavour on April 16, 1994. It is rainy, kind of – 3 times the amount of today. The Sahara Desert is no more. Since the rains came, it is a savannah. Fish swim in the rivers. In the thousands of miles of grasslands, Buffalo, Elephants, and other large animals graze. And humans follow and they thrive. The total world population is around 5 million; a significant part of it lives here. Small towns begin. Small farms lay beyond. With pottery, people can dine on soup, fish, and porridge. Cows lo on the farms; dogs wander the streets of the towns. If we could time-machine the Plains Indians of the American Mid-West from the days of Sitting Bull and Crazy Horse to these times and this region, they would fit right in. To the east, the lower Nile River rages from flood waters from the mountains far to the south. The settlements struggle against the floods. Times change; climate changes. The rains slow down; the rivers dry up; the grass disappears; the desert returns. To the east, the Nile’s floods moderate. People begin to leave. In Egypt, one of the world’s first civilizations begins. The desert sands blow over a way of life. More information: National Geographic, Wikipedia.